The living room is one of the most fundamental rooms in the house. It is the space where we interact with friends, families and visitors, where we rest and recover from a long day and where we truly feel at home. This is why the way that we decorate this room says a lot about our personalities and styles. What does your living room design about you? Are you easy going or rather somber? 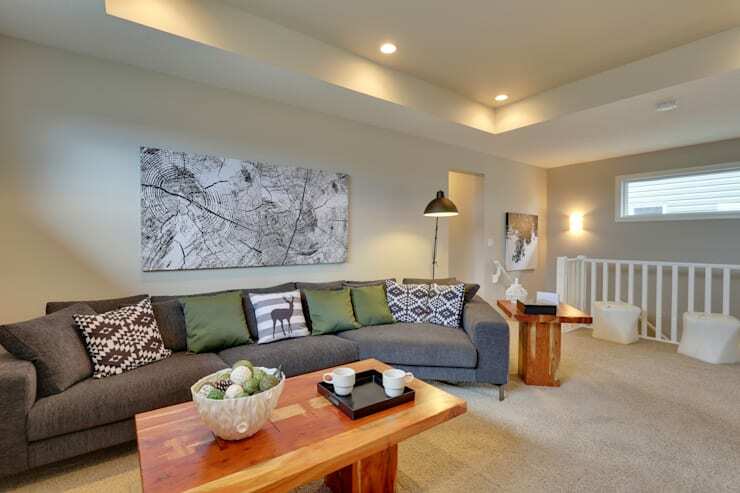 Do you prefer elegant environments or a more cozy and comfortable look and feel? Do you even know what your style is? Today on homify, we have put together 10 fabulous examples of different living rooms to show you just how many options and varieties exist. You will soon discover exactly what your tastes are. The open concept of a living room, where it flows into the kitchen, is very fashionable. However, it can also be functional too, especially when there isn't too much space available. In this design, we can see how beautifully this open plan structure works, with a very cozy and warm living room that is enhanced by natural materials such as wood. 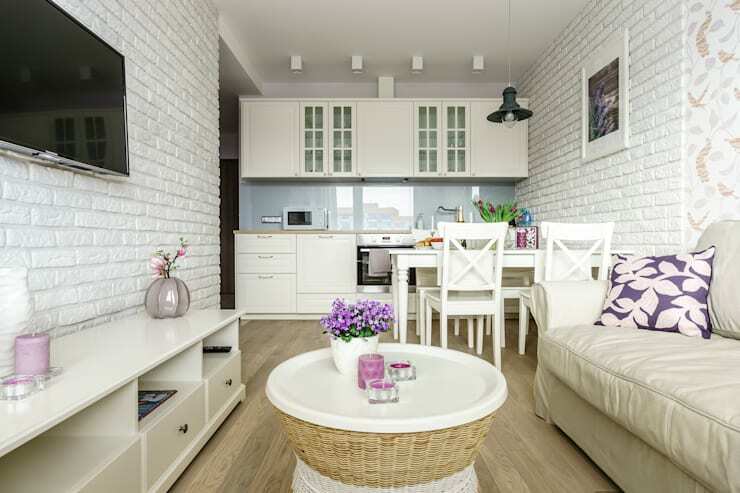 The white shades of the brick wall make this space seem that much bigger too! This second living room, designed by the interior designers at Sonata Design is very refreshing and shows just how important details are in a home design. The textiles and materials used throughout work together in harmony, while the green tones bring in a refreshing and natural touch. The Calgary-based designers have also carefully selected artwork for the walls, which introduce personality and charm. Take a full tour of this Canadian home if it piqued your interest. In this room, we come across a slightly more sober design with beige curtains, earthy colours and and black and white finishes. 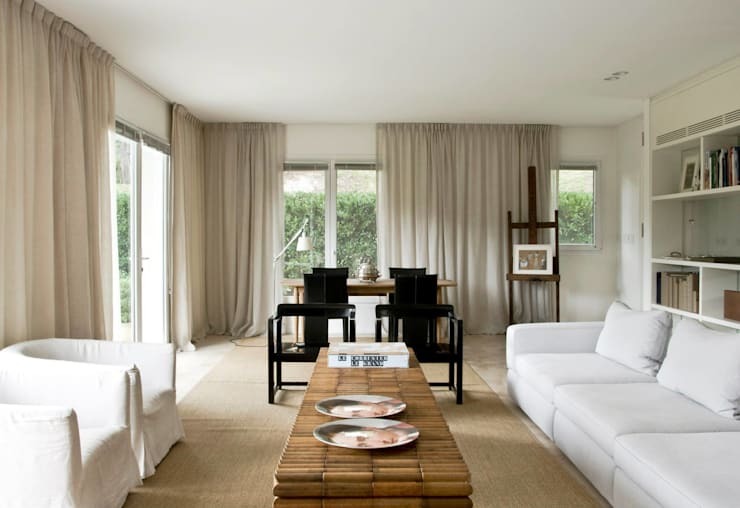 These neutral tones bring a very elegant and serene ambiance to the living area. 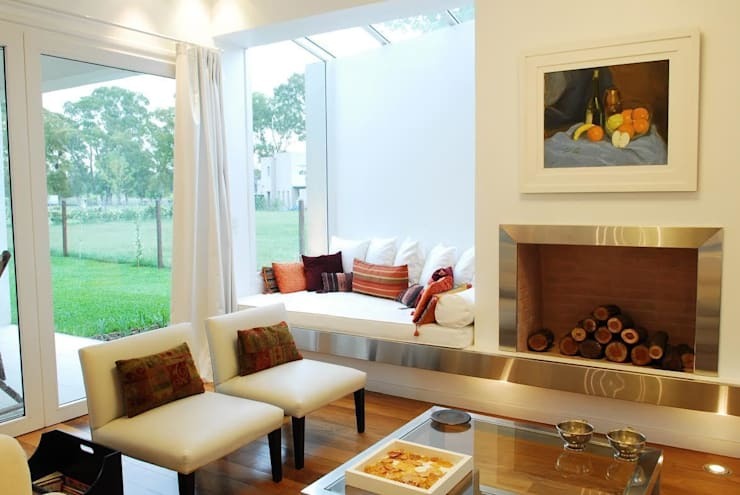 This living room belongs to a very modern house, with high sloping ceilings and glazed windows, which connect the interior spaces to the exterior spaces. Don't you love the spectacular garden that surrounds the home? The futuristic fireplace that seems to float in space contrasts beautifully with the intense colours of the sofa and cushions. This image brings us a design that highlights the modernity of living room designs, but in a different way to what we've experienced before. The white colours contrast beautifully here with the silver finishes, giving this entire space a touch of luxury. This is a very functional and stylish living room! From the explosion of colours that we've seen in other living rooms, we now come across a far more discreet design. 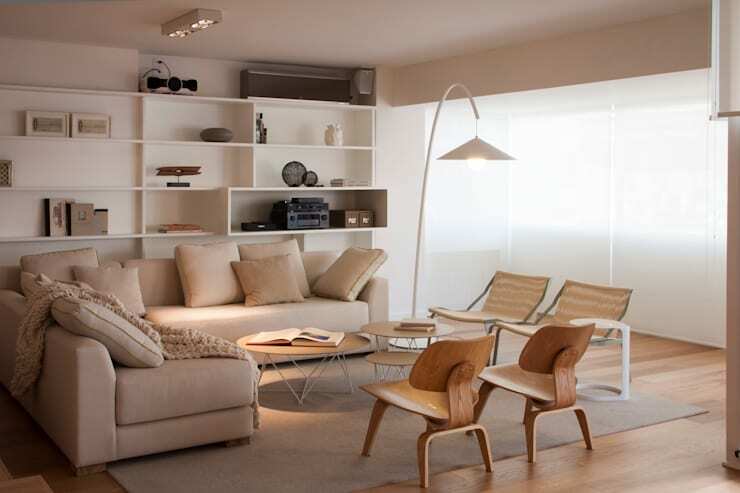 In this room, there are no brushstrokes of colours and the decor features a range of beige and earthy tones. There is an emphasis on a balance of design, with classic pieces of furniture throughout. For lovers of the countryside or those who prefer a more rustic style, we come across this gorgeous room. 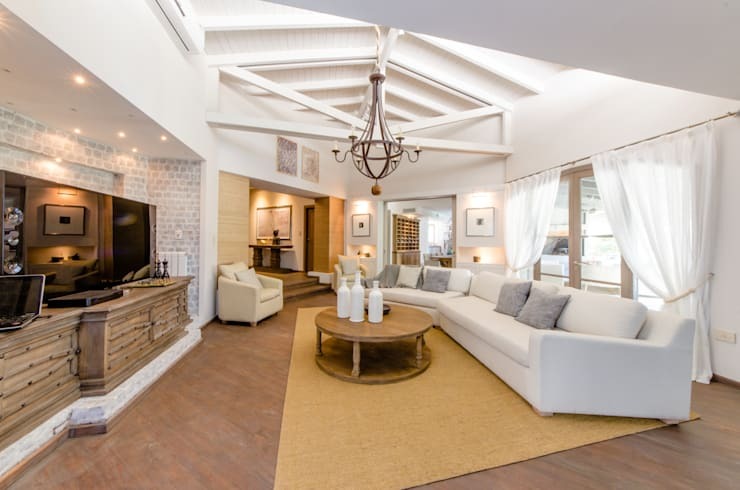 The high ceilings with the white beams show how modern and rustic designs can work together in harmony. The long white sofa is incredibly elegant, while the wooden table and the lamp bring in the more natural and earthy tones. 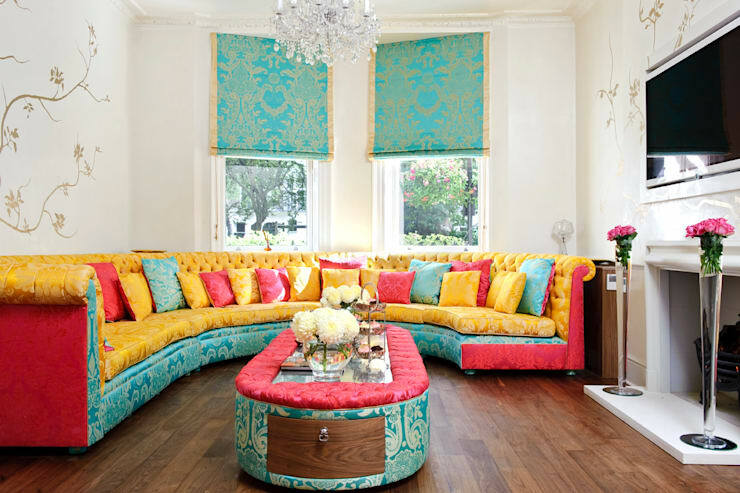 This is one of the most fashionable living rooms that we have ever seen. The dark tones of the walls highlight the furniture, while the paintings that hang on it introduce geometric shapes and colourful patterns to the designs. The textiles are like the cherry on top! Don't you love how functional items such as the lamp and the coffee table are also edgy and stylish? A lot of people think an industrial design is quite raw and unrefined. 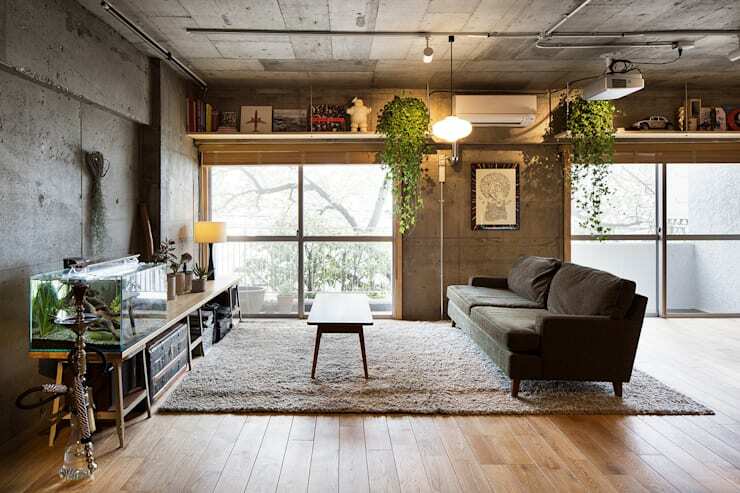 However, as this image clearly demonstrates, the industrial look and feel in the living room can result in a very stylish urban environment that is full of beauty. Do you see how green details have been included such as hanging plants? The Scandinavian furniture is the final touch. We end off in a living room that is as ostentatious as it is luxurious. The space features striking colours of very bold combinations, which work in harmony with the beautiful crystal lamp. If you've enjoyed this article, also have a look at these 6 mistakes to avoid for the perfect living room. Which living room design speaks to your personality?